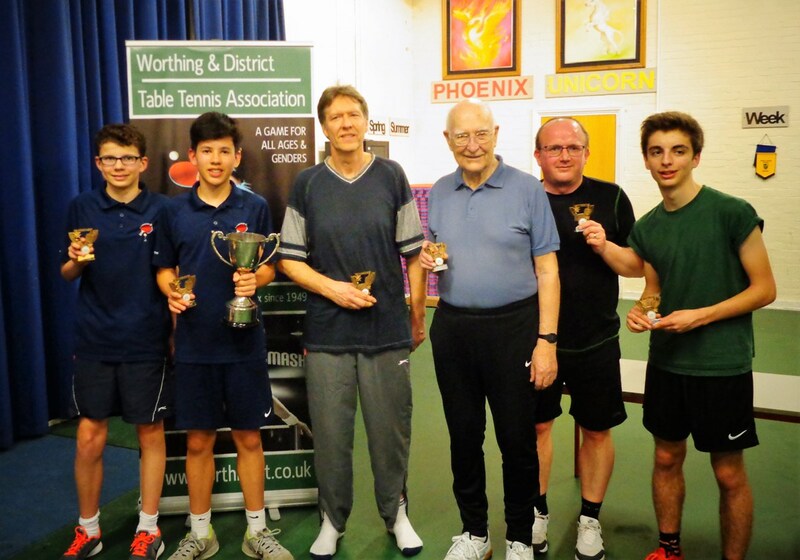 The 2016-2017 final was held at North Lancing School on Thursday 16th March between West Chiltington ‘B’( Div 4,) and West Worthing from( Div 3). The final is played over 9 games with all points scored added up together to find the winning team. West Chiltington ‘B’s team was Stuart Li-Tremble, Jacob Tofts and Kirk Reed and West Worthing’s team was Andrew Gifford, Andrew Kerkhove and Nick Burden. A good crowd watched many excellent rallies between the teams with West Chiltington ‘B’ coming out on top with 411 points to West Worthing 369.5 a win by 41.5 points.